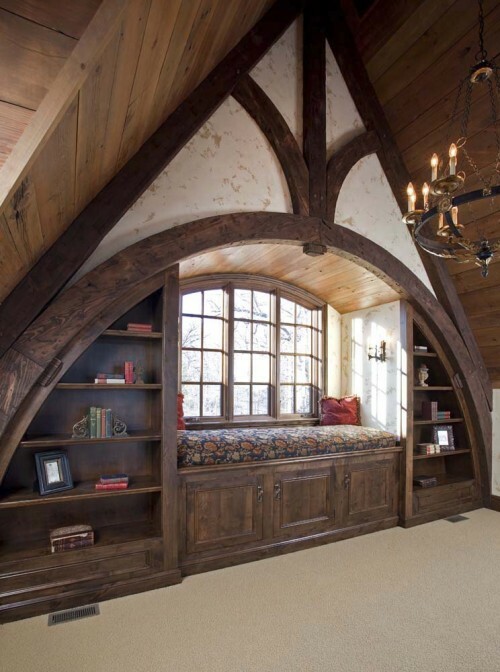 Many, many many attics incorporate wood in their design. It is mostly common in old homes that are made of wood but some modern designs use that materiel too. 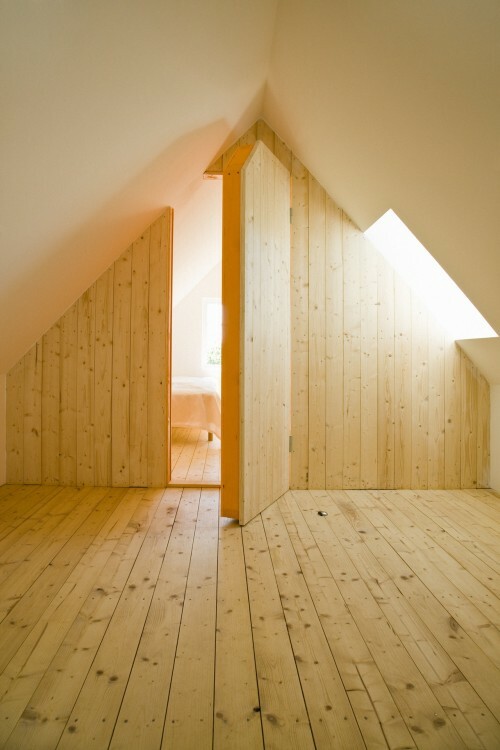 The obvious way to incorporate wood in the design of an attic is to use the bare rafter as walls/ceiling. In the pictures below you can different ways wood was used in the design of an attic space. This almost magical woodsy space is used as a studio. All he elements in the room add to its mysterious, woodsy dark feeling: the dark wood floor, ceiling and furniture, the limited amount of light coming in, the deep red carpet and canopy and the unique wood room divider. 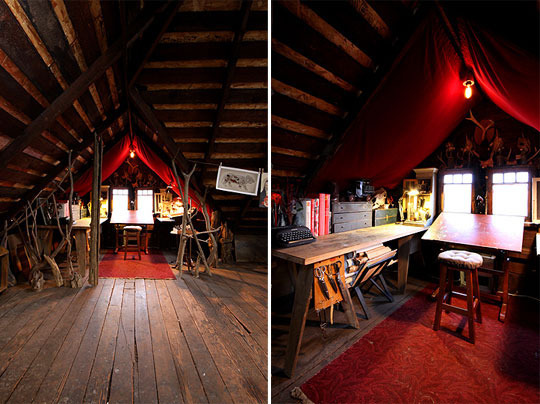 defiantly one of a kind attic. Another "woodsy" theme attic is demonstrated below. Here the very high ceiling room was used as a bed room. The designer used soft feminine fabrics and an ornate chandelier as contrast to the hard dark wood the attic was made of. The hugh fireplace adds to the cozy and warm atmosphere of the room. 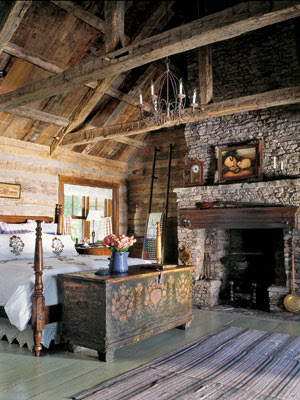 Another amazing rustic bedroom, though totally different from the last two (honestlywtf.com). 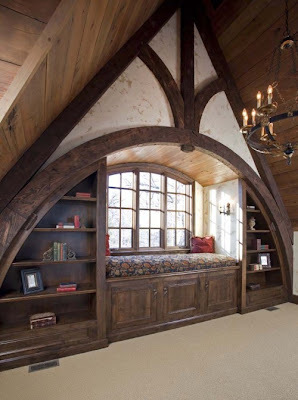 This spacious attic below by Design Associates - Lynette Zambon, Carol Merica (houzz.com) incorporates traditional materials and craftsmanship. The outcome is rather contemporary. A space for entertaining and fun. 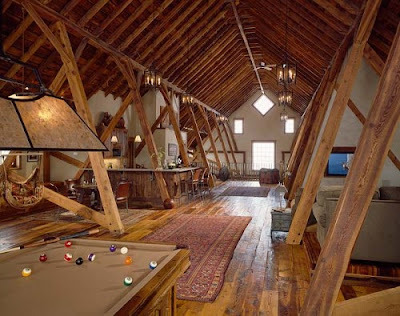 The attic is divided to different zones by their function: seating, bar, billiard etc. The next picture is of a corner in an attic. 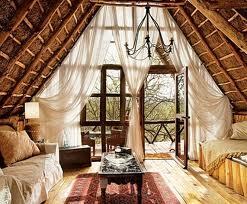 Here the dramatic wood roof set the tone of the room. 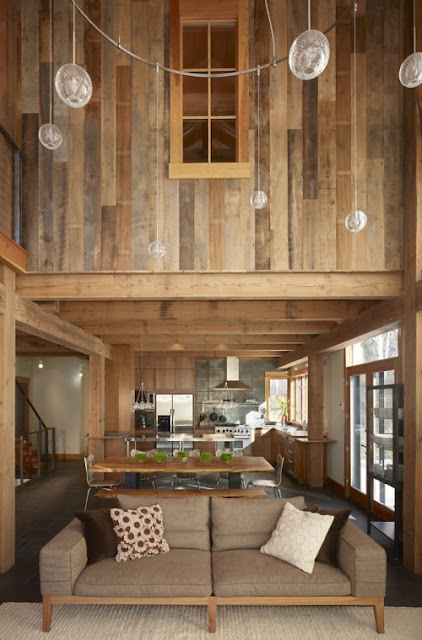 The honey color of the wood adds warmth to the space. The low ceiling adds also to the cozy feeling. 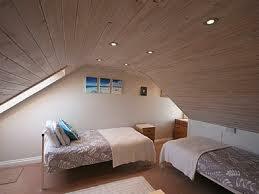 Here is an example of a wooden attic with a contemporary flair. This was achieved only by using paper﻿ lanterns that add to the unique feeling in the room. 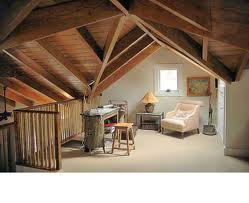 The attic corner below by Hendel Homes, Rick & Amy Hendel (houzz.com) is an example of fine carpentry. Beauty and function are blended together. 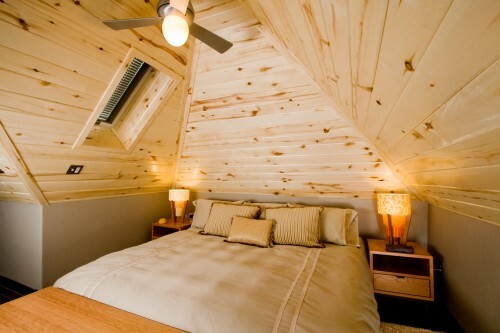 An attic loft created with a lot of wood by Robert Hawkins (houzz.com). More wood was used in furnishing the space but somehow it is not too much. A wood wrapped office space by Gelotte Hommas Architecture (houzz.com). In the attic bedroom below you can see another use of wood in a contemporary manner. 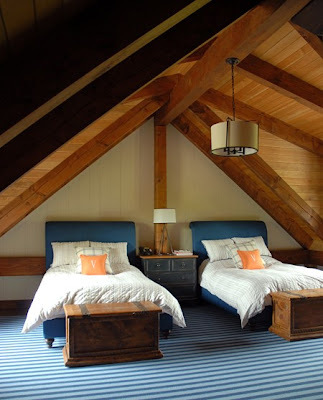 There are traditional wood elements in the room - the beams and the trunks. On the other hand, there is a modern use of wood - in the use of two different tones of wood and in the way the wood was set on the ceiling. Adding the Upholstered beds in a bright blue and contrasting color pillows adds another layer to the design. 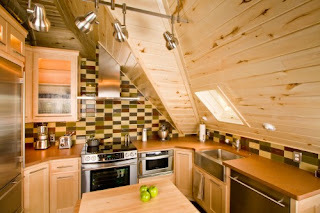 Here is a rustic wooden attic (Flicker.com). The walls were painted white in the past and in many places the paint had cheeped, exposing the wood underneath. The floor is in natural wood color. The result is rustic and simple. I find it charming. Don't you? This attic wood ceiling was white washed and hang in a rounded way over the room. It almost feels like a cave. In this attic remodel (Elle Decor) the designer took a bare attic into a light-filled room. The ceiling and floor where painted white. A window bench was built wall to wall. The room was decorated with art that the owner collected while traveling. The stairs rail is made of a rope. In the next attic one wall was covered in logs, while the ceiling was covered with flat wood planks. All the wood in the room is light in color. 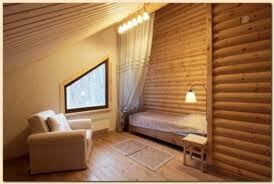 The use of light wood color reduces from the "heaviness" of the wood and opens the space visually. The curtain and the curved upholstered armchair also add softness to the room. 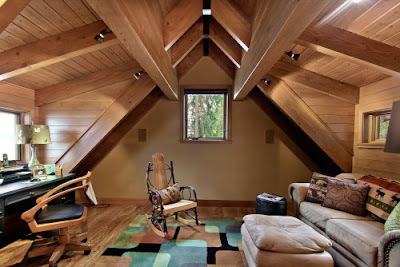 The next two images show two spaces in the same attic, done by HighCraft Builders (houzz.com). 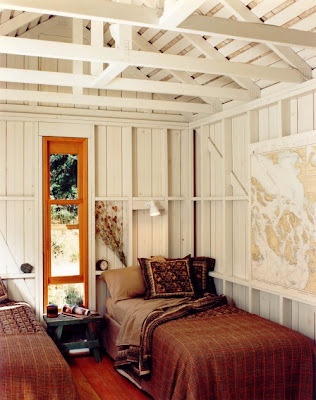 The first image shows the bedroom, all wrapped in wood paneling in a natural light color. The wood "wrap" continues in the kitchen. The cabinets match the wood of the ceiling. The same tone of wood was used in this attic over the floors and accent wall by LASC Studio (houzz.com). 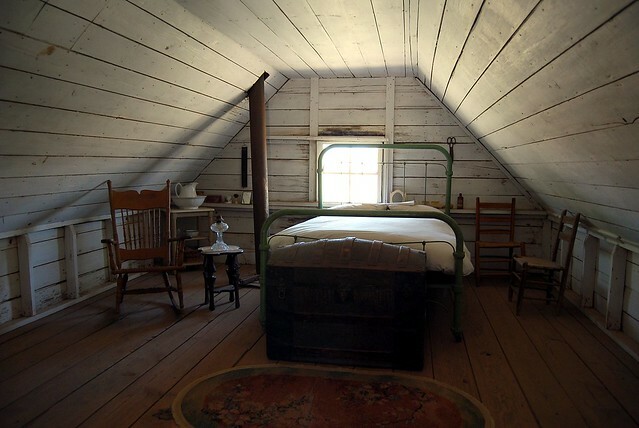 Here is a classic country cottage attic. All the wood was painted white and most of the furniture are white too. The vintage furniture add to the cozy "old world" feel of the room. Combining all the white elements in the room with white and yellow bedding freshens the room and glides it to the 21st century. Attic Bedroom with dramatic high ceilings and mahogany floors. Sheer curtaines netting around the bed. Great master retreat. A space that remains open and light, making use of the best that an attic has to offer: sloped ceilings and great lighting. (CoastalLiving.com). A guest bedroom by Bosworth Hoedemaker (houzz.com). Here is a country bedroom per-say. 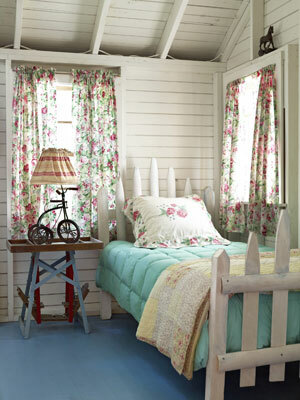 White wood allover, Floral curtains and picket fence kinda bed. Here the blue is on the floor. A nice surprise. This country white attic living room is as charming as the two bedrooms above. It was decorated by using the same principals (Real Homes magazine). A beautiful seating rom (bedroomscene.tumblr.com) that combines different wood tones and colores. The upholstered furniture soften the room. I am ending this post with another amazing attic. Tall, tall, tall wooden ceiling walls. A whole wall made of glass, with an exit to a porch. Long flowy sheer curtains and iron chandelier. OMG.